We all want a beautiful lush green lawn. And one way to achieve a beautiful lawn that will be the envy of all of your Kansas City neighbors is with the use of traditional chemicals. Chemicals that we use to achieve our ideal lawns are nothing more than a tool. And like all tools they need to be used at the right time for the right job. But we all know certain chemicals can have potentially deleterious effects to our health and the environment if the proper precautions aren’t taken when using them. Wouldn’t it be nice if there was a way to get that beautiful lawn we’ve always dreamed of, and that we can be proud of, without the use of harmful chemicals? Unfortunately, in most cases they are necessity to achieve a truly aesthetically pleasing appearance in your lawn. However, there are many things we can do to reduce the amount of chemicals needed to make our lawn beautiful and healthy. When it comes to preventing weeds, the best defense is a good offense. This means creating an environment that makes it difficult for weeds to germinate and survive. The best way to go about this is simply mowing your grass taller. This will allow the roots of the grass to grow stronger, and the coverage to become thicker. 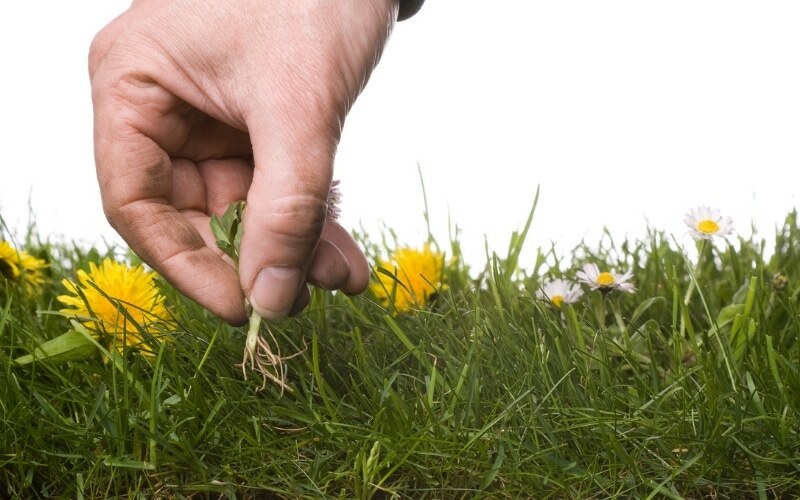 Over seeding is another way to crowd out those undesired weeds. If there isn’t any more room in the soil for the weeds to grow, they’ll never have a chance to germinate in the first place. In comparison to restoring a weed infested lawn, a bag of grass seed is cheap. So don’t be afraid to really throw it down this spring, and do it again in the fall. The more grass you have growing in your lawn, the less space there is for weeds to grow. Once you the desired amount of grass to crowd out the weeds, keep the soil healthy by fertilizing and aerating. Have a Kansas City lawn care specialist test your soil, and come up with a fertilization plan that will help your lawn thrive all season long. Unfortunately, weeds can grow in almost any soil. And weeds will also benefit from fertilizer just as much, if not more than your grass. But we at least want to level the playing field, and remember number one on this list, crowd out weeds with thick healthy grass. Using an organic fertilizer is also a great choice. Along with helping the grass grow thick and green, organic fertilizers are healthier for the soil in general. And when it comes to creating a beautiful lawn, healthy soil is very important. Not all herbicides are made of nasty chemicals that can harm our health. Organic soaps, plant oil blends, and even other household products are all used as organic herbicides. Some research suggests that vinegar may not be as effective at killing weeds as many people would believe. The problem being, that it does have trouble killing the roots of some larger weeds. However, research does show that drenching targeting weeds with vinegar will kill them without any risk of toxic runoff. It is important to keep in mind that vinegar is not selective, so it will kill anything it comes in contact with. Also, always avoid eye contact and follow label instructions, even when using organic herbicides. No one method of organic weed control will work all of the time. And synthetic pesticides will likely always be a part of a good lawn care program. But the goal is to reduce the amount of harmful chemicals needed to make our lawns beautiful and healthy. With a little research, or help from a professional, a thick green weed free lawn is most definitely achievable without soaking your lawn in harmful chemicals. Look into managing your lawn in an Eco-friendly way this year. And always, if you need help getting started, Pro Mow is here to help! What Steps Are You Taking To Prepare Your Lawn For Spring? When is the best time to get lawn care quotes?